What can social media tell us about the outcome of the EU referendum? Recent elections have made great use out of social media for boosting political outcomes: Barack Obama’s victories in 2008 and 2012 are prominent examples of a politician using social media to generate significant traction among the electorate. So in these final days of frantic campaigning, should we even pay any attention to traditional opinion polls? Should we not instead focus our analysis on people’s behaviour and allegiances on social media? When we talk about ‘social media’ regarding politics, we’re really just talking about two platforms, Facebook and Twitter. These two platforms are used for very different purposes: Facebook is used more as an advertising platform by both sides of the debate. Facebook has a huge reach, and due to its wealth of user data advertisers can target people with high precision. Facebook was used prominently by the Conservatives in the 2015 UK general election: they spent over £1.2 ($1.7) million on Facebook advertising, whereas Labour spent just under £16,500 ($23,500). However, it’s on Twitter that the discussion becomes really useful for analytical purposes. Twitter’s strength has always been its use as a wide-ranging instant discussion forum, and its platform mechanics such as retweeting and hashtags lend themselves to big data analysis. The polls look to be swinging somewhat decisively towards a vote to leave the EU, after months of being neck-and-neck. However, according to recent Ontotext analysis of the general mood on Twitter, the Leave camp has been ahead for months. 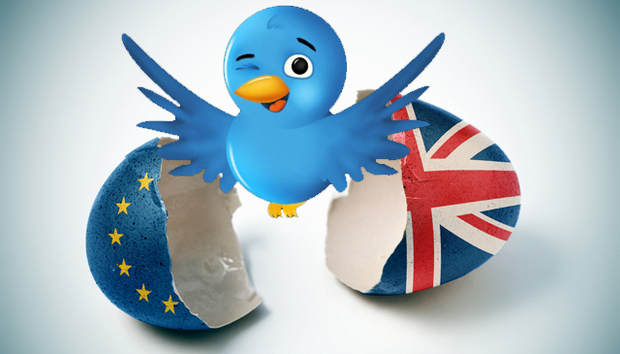 The study analysed over 1.5 million tweets related to the EU referendum, filtering them by common referendum-related terms such as “#Brexit” or “UK EU vote”. By count of hashtags used, the Leave campaign is well ahead of Remain: the official “#voteleave” hashtag was mentioned 217,884 times, 2.6 times more frequently than the official “#strongerin” hashtag was mentioned. Overall, of the top ten most frequently tweeted hashtags about the referendum, only three were affiliated with the Remain side. The picture gets worse for the Remain camp when we look more closely at which media sources are most influential on Twitter. Many would assume that the BBC would be the most linked source on Twitter, but this simply isn’t the case: it is in fact the Daily Express which reigned supreme, with over 26,000 links. The BBC comes in at second with nearly 19,000. The Daily Express is a strongly right-wing pro-Brexit paper, and from its prominence in the online conversation we can infer that the Twitter population has significant Brexit sympathies. Tweet volume is one thing, but what about influence? The number of retweets a Twitter user receives is a pretty reliable measure of their influence on their fellow users, and thus the wider conversation. Ontotext measured the accounts that have been retweeted by others the most on the topic of the referendum, and all five were pro-Leave. @LeaveEUOfficial topped the list with over 70,000 retweets, followed by VoteLeave, David Jones, Nigel Farage and TheOrdinaryMan. Clearly, the Leave side is not only tweeting more frequently, but its tweets are falling on a receptive audience. A common criticism with social media analysis is that it fails to measure the nuances of the conversation. According to the Ontotext analysis, the Leave camp is more vocal on Twitter, but that just means a generally higher volume of tweeting activity. This may not necessarily translate to a result for the Leave side on the day of the vote: what it does tell us is the relative efficacy of each side at social media campaigning, and in this regard, Leave is certainly ahead of Remain. Social media polling is never entirely accurate, and must always be treated in the context of a wider picture. People are not necessarily their true selves on Twitter, and are prone to exaggerating their personalities and viewpoints. On the other hand, people are likely to be more honest when speaking to their social media contacts than they will be talking to an anonymous pollster. Whatever the result of the referendum, it’s been a thoroughly social media-heavy campaign and we’re sure to learn a lot about the general accuracy of this type of polling.